Sorry, kids, but humor has no place in a cover letter, and unfunny humor has no place anywhere. Don’t depend on a spell checker – print your resume out and look it over, read it out loud to yourself, and have another person look at it for you. 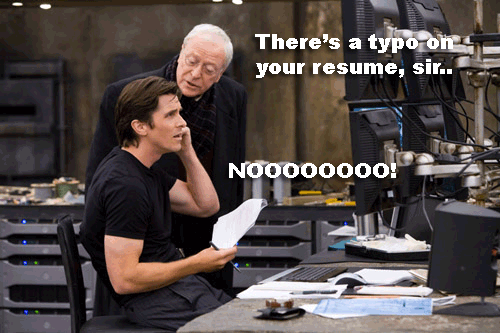 So far my most egregious mistake on a resume has been of the grammatical nature, something that I hope never changes. But if I want to be realistic about things, I’d have to say that this could very well happen to me. Even worse, sometimes I feel inclined to throw some humor into my resume to make it lighter or just DO SOMETHING new and fresh with it. After reading this article though, I know better. Still, the joke about the wallpaper was hilarious. I actually giggled like an idiot. When I interviewed for my current job, a typo was pointed out to me on my resume: I had listed a .333 GPA for my time at university. “My wife wanted me to give you crap for that one,” I was told. Well, that’s good that you ended up getting the job despite that. I always fear that there’s still some lurking snafu on my resumes that’s just waiting to be found by the right person..
Well, that's good that you ended up getting the job despite that. I always fear that there's still some lurking snafu on my resumes that's just waiting to be found by the right person..